Calvary Christian's Samuel Gordon comes home to score Friday's first run during the Warriors' 7-2 District 4A-4 win over rival Clearwater Central Catholic. CLEARWATER – Clearwater Central Catholic took its best shot against Nolan Hudi right away. 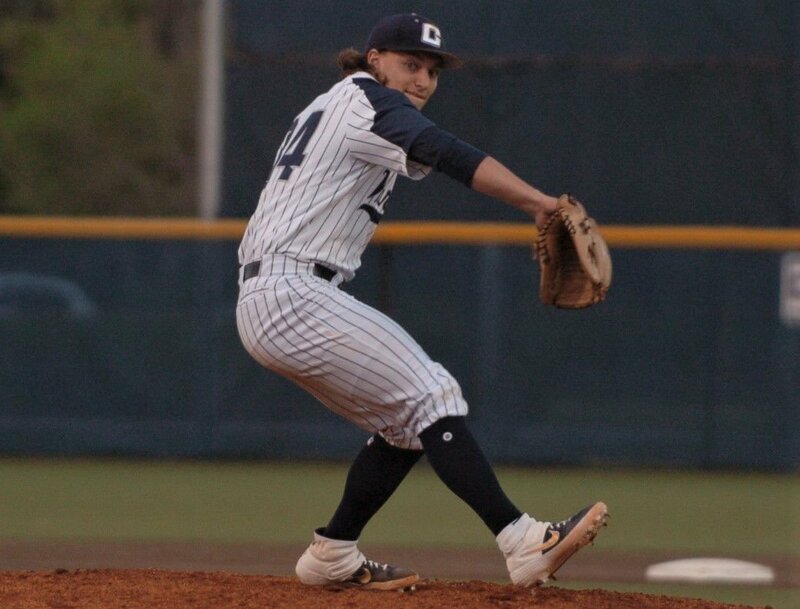 Calvary Christian’s star pitcher found himself in trouble in the top of the first inning, with three of the Marauders’ first five batters reaching base. None of those base runners crossed home, however, and Hudi locked things down for the remainder of his 74-pitch, five-inning outing. The Warriors gave Hudi a 2-0 lead in the second and did so by taking advantage of CCC’s sloppy defense. The Marauders committed two errors in the frame and five on the night, allowing Calvary to score four unearned runs. Hudi escaped the bases-loaded jam in the first with a strikeout and racked up a career-high 13 in just five innings. Seven different Warriors recorded their seven hits on the night, including a third-inning triple off the bat of Smith and a first-inning double from Hudi. Right fielder Bo Planeta went 1-for-2 and drove in a pair of runs. CCC plated its runs in the final two innings after Hudi exited. Dean Mercer produced the night’s lone multi-hit performance, going 3-for-3 and driving in a run in the sixth. Calvary has now won seven straight over CCC, dating back to 2016. The Marauders’ last win in the series can March 3, 2016. The Warriors play three times next week, including District 4A-4 road games at Tampa Prep on Tuesday and Tampa Catholic on Thursday. Calvary wraps the week up Saturday by hosting Naples Barron Collier. Tuesday’s game against Tampa Prep allows Calvary to avenge its lone loss of the season and first non-postseason defeat since falling 4-1 to Berkeley Prep on April 11, 2016. “Props to them. They beat us on a night we were down, but they beat us,” Hudi said of the 2-0 home loss March 12 against Tampa Prep. CCC plays a pair of district games next week, hosting Berkeley Prep on Tuesday and traveling to Tampa Prep on Friday.